Stanford is coming off a wildly impressive season that saw them finish with a dominating win over Virginia Tech in the Orange Bowl. Now we get to see if they can stay among the elite or if they were just a flash in the pan. It doesn’t hurt that they have the best quarterback in college football under center for them, but he’ll have to work with a new head coach after Jim Harbaugh couldn’t resist the lure of the NFL. The most striking difference between this season and pretty much any other in a long time is that the Cardinal come into this season fully in the spotlight and under the microscope. They will be wearing big targets on their backs, and everyone will be looking to beat them. Their ability to handle that pressure is going to go a long way towards determining how this season winds up. Shaw joined Harbaugh at the University of San Diego as passing game coordinator. That one year with the Toreros went so well offensively that when Harbaugh moved to Stanford he brought Shaw along as his offensive coordinator. Shaw has never been a head coach at any level, but he has coached the Heisman Trophy runner-up two years in a row, so he obviously has some game. Andrew Luck is Andrew Luck, so as long as he stays healthy it isn’t too hard to be optimistic about this offense. He has lost spark plug Owen Marecic and his two favorite targets, but there is still some depth, and Luck is a rare player so he can be trusted. The most interesting thing to watch is how well the transition from Shaw to new offensive coordinator Pep Hamilton goes. Hamilton was promoted from his role as wide receiver coach this year, but he had only been at Stanford for one season. He and Shaw obviously have a good relationship or he wouldn’t have gotten the job, but it is often very hard for a first-time head coach to give up control of what he knows best. Defense was a definite asset last year, and with seven returning starters this year — and a lot of experience in the secondary that was at times a weakness last year — they have the tools to be very good again this year. There is a real cause for concern this year, though. Defensive Coordinator Vic Fangio headed for San Francisco with Harbaugh, so a change has been made. Not only do they not have the brilliant Fangio, but they have gone with the dreaded co-coordinators. Derek Mason was the secondary coach last year, and Jason Tarver must have come the other way in the Harbaugh trade because he spent the last decade with the 49ers. Neither co-coordinator has experience in a job like this, and they don’t have a past working relationship to fall back on, so it is certainly possible that things could be a bit rocky on defense. If the Cardinal can live up to their potential then they are going to start the season 9-0. There are some tough games — like a trip to USC — but none that they can’t win. It’s the last three weeks that get interesting. On Nov. 12 they play Oregon, and then after a rivalry game against Cal they play Notre Dame on Nov. 26. Oregon and Notre Dame are going to be highly ranked coming into the season, so those should both be big tests. 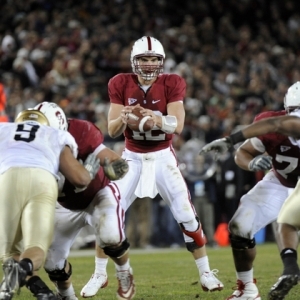 The good news for Stanford is they get all three of their final games at home. You know the public likes Stanford a lot right now if, despite all the coaching upheaval and the pressure the team will face, they are the seventh choice to win the BCS Championship at 16/1 according to Bodog. Some other books have them tied with Utah as the second choice to win the Pac 12 behind only Oregon at +175. WagerWeb also has them as the second choice to win the Pac 12 North at +140, compared to Oregon’s +120. This team makes me uneasy. I hate the coaching situation on defense, and I hate that Luck has lost the two receivers he had such a good relationship with on the field. Still, Luck is ridiculously talented, and he has a lot going for him. I think that the public is putting way too much pressure on this team so there is absolutely no value to be had, but I do think that 10 wins is easily manageable, and I wouldn’t be surprised to see them split those last two tough games. The winner of their game against Oregon will win the North division, and the winner of the North will cruise to the Pac 12 Championship Game, so big things are possible for this team — though I think they are deservedly underdogs to the Ducks.